The design process can be divided into research, conception and realization. In the research phase, there is an information chaos created by involving many different perspectives and possible starting points. In the following conception phase, patterns and interesting connections within this chaos are searched, thereby, the complexity is reduced to an essence. In the design phase, this essence is finally translated into a consistent visual form. Below you can find the exemplary process of a communication concept development. 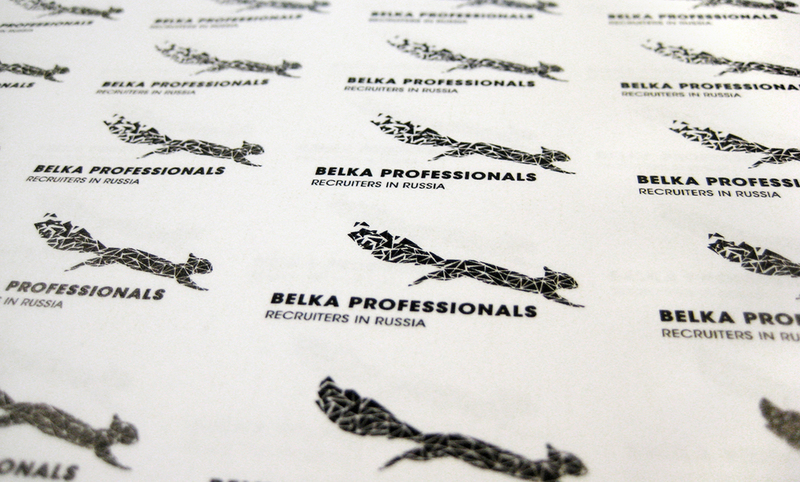 This project is for the Dutch Headhunting-Company “Belka Professionals” and was developed during my freelancing time for the agency »Out Of Office« in Amsterdam. The task was to develop a corporate design for a newly founded Dutch company which belongs to the recruitment sector. The company supports mainly European mid-size and big companies coming from different sectors in search of highly skilled people in Russia that match exactly what their needs are. Several European companies can come to them and they provide a network of many Russian recruitment agencies which enables to search the best matches out of a large pool of professionals. There was not yet a company name existing and it was part of the task to find a holistic story, including a name. There are suppliers of similar services, for instance, for Brazil or Mexico but not yet for Russia. This means that there was no direct competitor existing. After a good briefing with the clarification of the main questions and explanations about the services the company is going to offer, the first stage in the process was a deeper research. It was focused on the profession itself, on the visual language of other companies in similar sectors, and on the target group that is supposed to use the offered services. Besides that, there was a broad research on Russia, visual languages and arts, the Cyrillic alphabet, as well as the Russian culture and myths. The next step was about getting closer to the characteristics that identify the company that should be communicated. The research and the intensive conversation with the company founder have already given many insights that were relevant for this part. In addition to that, the owner filled out an identity questionnaire that helped to find the company’s key characteristics. Besides these, we also defined the main benefits the clients can expect using the company’s services such as the power of united forces, included rankings and individual service. All these, together with the main characteristics, built the base and the guideline for the following concept phase. It is fast and neat; it is a collector and is prepared for bad times. Thereby, it shares characteristics with the headhunting company. with emerald. It symbolizes a high profession in finding the best. Moreover, it shows insights into the Russian culture. The term “purple squirrel” is used by recruiters in the UK and in Australia to describe a job candidate with precisely the right education, experience and qualifications for a specific job. Since the squirrel is also a remarkable and distinguish- ing image, we decided to take this little animal as the main plug for the company’s communication. This phase was about connecting the attributes to be communicated with the basic story, and transform them into a visual form. For this, I first created a matrix that helped to connect different elements with attributes and characteristics in a systematical way. After that, the main ideation phase began in a classical manner with sketchbook and pencil, before some of these approaches were tested first by digital drafts. A number of the ideas that came up in the sketch book were digitalized and afterwards limited on the selection of four concepts to be presented to the company founder. These four basic concepts focus in different amounts on the specific key characteristics and lead to rather exclusive or modern appearing results. In the week after the presentation, the client got additional opinions from different kinds of people: CEO’s of different sectors, Russian people, as well as from artists and young entrepreneurs. Based on this evaluation, his personal preference and rational considerations, he made his final decision, which was the dynamic swarm-concept. As the basic concept was fixed, the detailed fine drawing followed. The main shape was worked out in detail to create a clearly recognizable squirrel and make its movement visual. Moreover, a color concept for the digitally used logo was developed and adapted to the CMYK color space for printed applications. The aspect of dynamic and flexible parts that combine their forces to get more power is an important part of this concept. To communicate this in a stronger way, we decided to develop a series of logos which visualize this process. After researching on swarm dynamics and visualizations, I created an expendable series of slightly different logos. They can randomly be used on different applications or changed on the website. Finally, the result was processed into a form to be delivered to the client. This package contained the logo series in different color spaces and data formats, and also an overview sheet with application recommendations including color codes, minimal sizes and distances. Moreover, it contained an exemplary adaption of the corporate design on basic applications like business cards and letterheads.